Direct2Print will celebrate 10 Years of successful online document printing and fast digital printing this summer. The original web2print service was launched in 2003 and has become one of the leading online print services in the UK. The original Direct2Print service came about due a combination of circumstances and technological developments. After attending an expensive training course, the founder of Direct2Print, received a very poor quality PowerPoint presentation print out of the slides and notes. The trainer apologised and claimed his ink cartridges had been drained by the heavy colour saturation used in the PowerPoint designs and had run out of ink in the early hours of the morning. The paper had curled and the colour quality was inconsistent. A 24 hour, 7 day ordering system had been developed and with the help of a European Development Funding Grant the new service evolved. The new technology of broadband communications over the internet, transportable PDF files, production quality digital presses and a gradual acceptance of the security and confidentiality of e-commerce as a safe and easy order process. There was no longer a need to get in the car, drive to the nearest print and copy shop on a congested road or in poor weather, park up, wait to be served or even repeat the whole process at a later time to collect the finished job. The whole operation could be completed with a few clicks of a computer mouse! In the early days, Direct2Print’s customers were able to price a job online, upload a file, get it printed and delivered faster than many of the local print and copy shops could provide a quotation. Direct2Print was a fast central production facility where out-based workers and executives could quickly obtain high quality printed tenders, quotations or printed PowerPoint presentations that would impress. 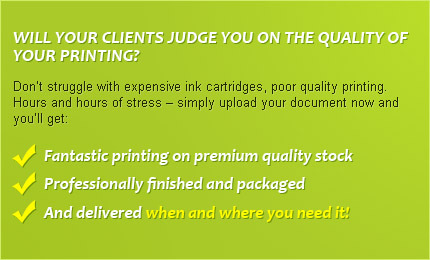 Online document printing maintained the corporate quality standards no matter where staff were located. There was also an element of financial control – so that printing that was being paid by company credit cards had varied by as much as 90% in different parts of the country could now all be purchased online at a known cost to aid budgeting and control. In the last ten years the business has continued to evolve. A specialist web site for the production of funeral stationery was developed specialising in the design and production of orders of service for funerals. Amongst the other unique innovations is a unique performance monitoring system to measure the key indicators of service and the loyalty reward scheme, established to further reduce the costs of regular customers and this Premier Club still exists today. And a new website for the production of popular printed products served the increasing demand for the supply of online business stationery and in particular the ordering of luxury business cards, letterheads, compliment slips and marketing materials. The low cost and ease of use of graphic design software has resulted in more and more people prepared to generate their own artwork for all types of printing. All Direct2Print websites have offered prices related to speed of delivery. If a job is not particularly urgent, customers could save as much as 30% on their order cost. However, printing deadlines are getting shorter and shorter - often now in hours rather than days. Direct2Print meets the need for the really urgent jobs perhaps better than any other comparable service in the United Kingdom. There is no doubt that in the next ten years there will be even more changes but the principles of Direct2Pint will still be very much the same – a total quality guarantee, fast digital print and document production and a simple and easy online order process.